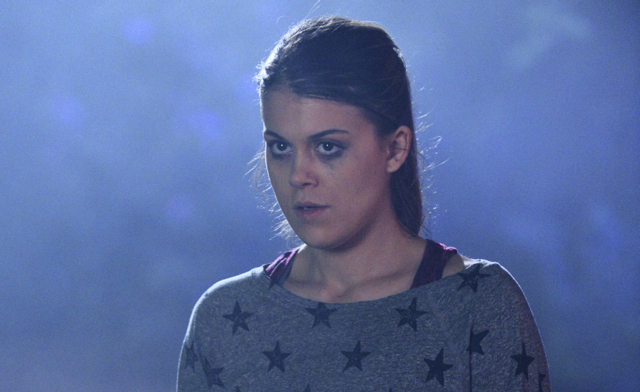 PLL’s Lindsey Shaw: Does 8th grade coolness really matter? – Live! Starring ... You! Lindsey Shaw as Paige McCullers on Pretty Little Liars. Photo courtesy of ABC Family. Lindsey Shaw was just minutes into her first day of seventh grade at her new school and already it was time for recess. Finally, she thought to herself, a chance to breathe and relax. Lindsey’s mom had just finished walking her down to her new classroom. Her new teacher was friendly enough, and asked her a bunch of polite, get-to-know-you questions like “Oh, you came from Nebraska?” and “You’re here to be an actress?” But normally talkative Lindsey wasn’t saying much. She knew the kids in the class were listening. Check that. They weren’t just listening. They were examining Lindsey, as if she were a specimen on a slide underneath the lens of a microscope. The girls walked Lindsey out of the classroom and to the schoolyard. One of them turned to her. She scanned Lindsey from top to bottom, starting with Lindsey’s long, straight brown hair, working her eyes all the way down to Lindsey’s feet. Lindsey’s eyes widened. She opened her mouth, but didn’t quite know what to say. How could she answer? People back home in Nebraska didn’t ask questions like that, especially not the first time they met a person. Lindsey assumed the new kids and new school would be an adjustment. She never thought moving to a different state would be easy. But this felt like a different planet. Lindsey went home that afternoon and cried. No matter how hard she tried to blend in, a couple things made her stick out: She came from a different place and she was here to be an actress. She wanted to be a regular kid, too, but a few of her classmates wouldn’t allow it. In the past, Lindsey’s friends and classmates had been supportive of her show-business dreams. As a little girl in Nebraska, she starred in several school plays. In the fourth grade she won a talent competition and started doing commercials and modeling. By age 11 she was working professionally in New York City. That went well enough to prompt Lindsey and her mom to move to Los Angeles so she could pursue a full-time Hollywood career. Hollywood didn’t get to Lindsey. Kids did. Kids who were her own age, but had a nasty streak. Kids who didn’t have patience for anyone whose interests or clothes or background were different. Years later, Lindsey still hurts a little when she talks about her middle-school experience. She has a different perspective on it now. “Really,” she says, “does it matter in your eighth grade class who thought you were cool?” She knows that when you’re in eighth grade, yeah, it does matter at the time. But she also knows that you can get through it — because she did.